The owner of a drive-in theatre has been professionally informed on the optimum angle that the screen AB should present to the viewer (Figure 1). But, only one customer can sit in the preferred spot V, directly in front of the screen. The owner is interested in locating other points, U, from which the screen subtends the same angle . An angle inscribed in a circle is measured by half the intercepted arc. Inasmuch as is measured by the same arc as , the angle at U is the same as the angle at V. (If you want a proof of the theorem, just let me know). A typical example of a calculus problem is this: Of all triangles on the same base and with the same vertex angle, which has the greatest area? We are able to steal the show briefly from calculus and solve this problem almost at a glance, with the aid of Theorem 1. If AB is the base and the given vertex angle is , then all the triangles have their vertices lying on the circle of Figure 1. But, . One half the base is a constant, and the altitude (and hence, the area) is greatest for AVB, the isosceles triangle. Even to set up the problem for the calculus approach is awkward (try it and see!) and several lines of careful calculations are required to solve it. From Theorem 1, we also have the useful corollary that any angle inscribed in a semicircle is a right angle (measured by half the 180 arc of the semicircle). 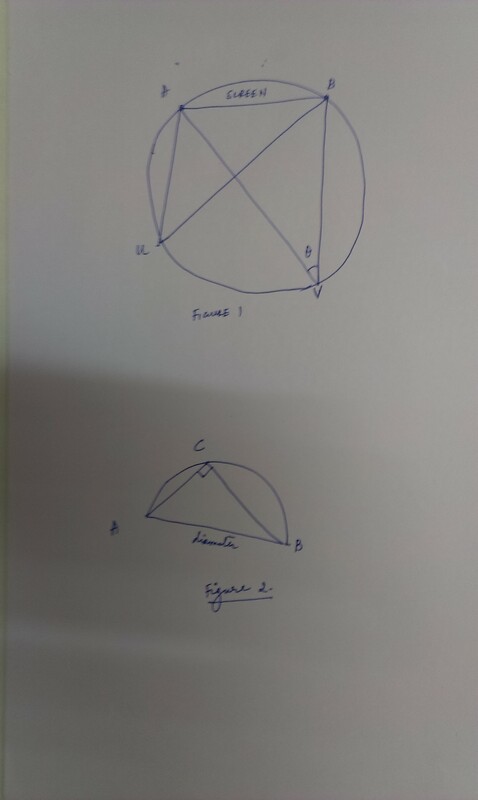 If by any chance we can show that some angle ACB (Fig 2) is a right angle, then we know that a semicircle on AB as a diameter must pass through C. This is the converse of the corollary.